We have very special access to the rooftop of one of the most historical buildings in Shanghai, located in the heart People’s Square, Rooft 325. This stunning art-deco building is the Shanghai History Museum and, after an extensive 18-month renovation, the top floor restaurant has transformed, showcasing the building’s unique architectural heritage. Members will have access to the inside bar area as well as the large rooftop sitting under the ancient clock tower with stunning views of People’s Square. Located in the same lucious green park as Barborosa and MOCA Shanghai Art Museum, we it could not be farther from the loudness of the bustling city, sort of like a little oasis. Guest may peruse the terrace or hang out in the large bar area inside. 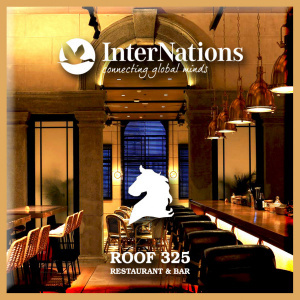 Roof 325 has made a special menu for InterNations including discounted cocktails, other drinks, and food. The amazing wine is sponsored by LastCorkWines.com, check out their site for some of the best prices on wine in Shanghai. As always, come prepared to meet wonderful people from all over the world. The dress code will be smart casual with recommended sports coats for gentlemen.